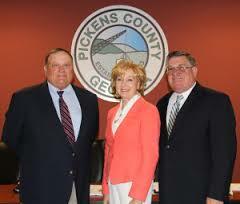 JASPER, Ga. – A new collaborative effort saw attention at the Pickens County Board of Commissioner’s April meeting. Known as “Ready Pickens,” the effort could improve the public safety readiness of citizens and students in the county. Currently, Pickens High School has a pathway for law enforcement and public safety for its students. According to the presentation at the meeting, they have a CERT (Community Emergency Response Team) program as a part of the curriculum. However, in order to certify and maintain that program, they need an organizational structure so the county will be involved in the emergency management. As a part of that structure, grant funds would funnel through the county. As members of the community began looking at how to build the necessary composition, the idea of “Ready Pickens” as a council was formed. The council represents the Board of Commissioners, Public Health Department, the school system, the community, and the volunteer fire service in one entity. As local officials look to the program to increase interest in training and preparedness, they also note the benefits of the shared push for the community, and the schools, to become involved in the public safety of our community. It was noted in the commissioner’s meeting that 160 students have already signed up for the CERT class in Pickens High School for the 2018-2019 curriculum. If each student completes the program, this would mean an increase of 160 young people trained in First Aid, CPR, basic fire suppression, and basic Search and Rescue. Additionally, each student will have already had practice in those areas at the high school campus. With the approval received from the commissioners during the meeting, progress will continue for the program and set an official show of support by the county government allowing for the application and reception of grants for funding and instruction for those who would be in leadership roles for the program. A final note on the topic during the meeting said that certain communities in Pickens could see the community training and expansion as early as this Fall. Also in the meeting, the Board of Commissioners approved several bid items including those for a 1500 GPM (gallons per minute) Custom Pumper and a 3000 gallon Super Tanker for the county. They received four bids on the Custom Pumper and two bids on the Super Tanker. The board unanimously approved Triton Emergency Vehicles as the lowest bid, $439,700, for the Custom Pumper and Freedom Fire Equipment as the provider for the Super Tanker. Freedom Fire offered two options, Option 1 cost $244,325 and Option 2 cost $239,325. It was reported that the only difference between the two is the chassis, Option 1 is a Peterbilt while Option 2 is a Kenworth. The county approved Option 2 as it was the lower cost of the two.